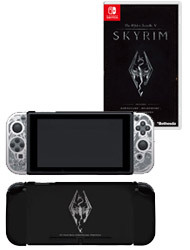 GameStop has revealed an exclusive The Elder Scrolls V: Skyrim Switch bundle, that, despite the name, will not include the portable home console. Instead, those that choose to place a pre-order for the bundle ($84.99) will receive a copy of the epic fantasy masterpiece and an officially licensed clear console case that has artwork that has been designed to resemble worn metal armour that can be worn in Tamriel. After the High King of Skyrim was murdered, an ancient evil has stirred that has seen Dragons, long lost to the passages of the Elder Scrolls, return to Tamriel. With the future of Skyrim left hanging in the balance, the people hold out hope for the prophesised Dragonborn to come – a hero born with the power of The Voice, and the only person that can take a stand against the dragons. The epic fantasy masterpiece will add some surprises on the portable home console, such as all-new gameplay features like motion controls for combat and lock picking, as well as outfits and gear from The Legend of Zelda: Breath of the Wild – specifically being the Master Sword, Hylian Shield and Champion’s Tunic. The Elder Scrolls V: Skyrim will release on Nintendo Switch worldwide on November 17th.